If you’re worrying that this is a Lumia 610 upgraded to WinPhone 8, fear not. The 620 more than doubles the 610’s processing power: its dual- core, 1GHz Snapdragon S4 chip and 512MB RAM mean you get a fair bit of muscle for your money. At a 800x480 resolution, the 620’s 3.8in screen won’t stop press for sure. On the plus side, fewer pixels equals less power-drain, which could explain Nokia’s optimistic-sounding expectations of the 620’s 1300mAh battery: 61 hours of music playback from a single charge. We know our readers are fashion conscious and now phone companies have started paying attention too – interchangeable shells means they can be swapped to complement whatever look you’re rocking. As long as you’re wearing something bright. Windows Phone 8 does not have the superb choice of apps you get with iOS or Android. However, its Live Tiles home screen looks more modern than its rivals. Pertinently for budget phone, Windows Phone also includes some strong parental controls. Your kids won’t be deleting your mails any more. The Lumia 620’s big brothers (the 820 and 920) have earned a lot of praise for their cameras, and the little guy gets the same skills, with Nokia’s multi- image-amalgamating Smart Shoot, animated-still Cinemagraph features and a dedicated camera button that gets you snapping in about a second. One of the smartest things Nokia has done with the Lumia 620 is that it has included a microSD slot that supports 64GB cards.Therefore, all you need to make your super-expensive phone totting colleague sulk, is invest in a memory card, which is available at astonishingly low prices. 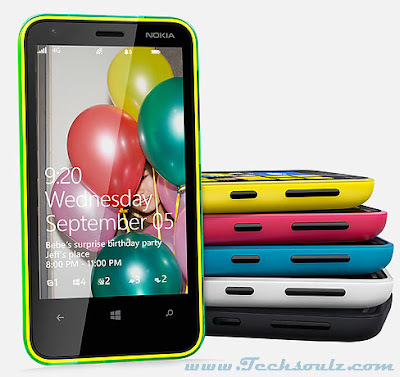 The Lumia 620 is a neat way to try Windows Phone 8 and we expect it to be aggressively priced.